For a long time polar bears were the poster child of climate change but that is no longer the case. Now it is an image of our fellow human beings, millions of them, battling on the frontlines for survival. While we in the west debate the merits of climate science, in large parts of Africa, Asia and the Pacific Islands climate change is a daily reality. Many of these communities rely on fishing and farming for their subsistence — but unpredictable weather and extreme weather events are wreaking havoc. This is especially true of East Africa where I have just returned from visiting communities on the brink of famine. Over 20 million people throughout the region are facing what the UN has characterised as the greatest humanitarian crisis since the Second World War. Everything I saw confirmed this assessment. Widespread malnutrition and in many cases starvation, is sweeping through Somalia, Ethiopia, Nigeria, Kenya, South Sudan, Malawi and Yemen. The crisis is being fuelled by conflict in certain areas while rising food prices and a large scale drought are affecting the region as a whole. In 2016 East Africa was hit by a super charged El Niño — a warming of temperatures on the surface of the Pacific Ocean. While dry spells are not uncommon for the region, abnormally high temperatures have intensified both the severity and the length of the drought. For farming and pastoralist communities the effects have been devastating. With over 30 years of involvement in global affairs, I have never seen anything on this scale. Millions of men, women and children are, literally, desperate for food and water. Released just last month, the Disaster Alley report warns that, if left unchecked, global warming will cause increasingly regular and severe humanitarian crises not unlike the one taking hold in East Africa. Images of droughts, famines, and mass migration are what we must now conjure up when thinking about climate change. 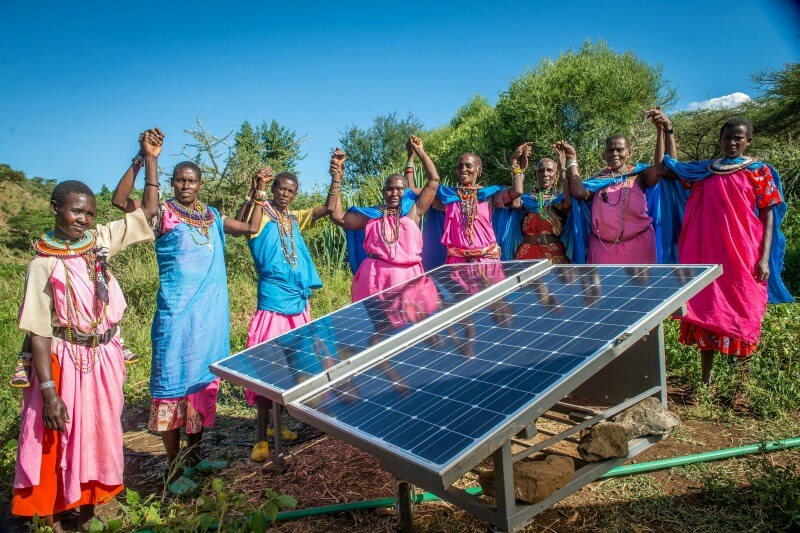 "While India and Chile are leading the way on renewables, whole communities in Kenya are being powered by solar panels. In the Pacific, people are finding novel ways to replenish diminishing fish stocks and grow cyclone resilient crops." But all is not lost. If we want to find the answers to climate change, many of them exist within the communities already being impacted. These people understand the urgent threat posed by global warming and they are banding together to find solutions. Caritas Australia works in 29 developing countries and in every one of them people are using their ingenuity and resourcefulness to harness solutions. While countries like India and Chile are leading the way on renewables, whole communities in Kenya are being powered by solar panels. Closer to home in the Pacific, people are finding novel ways to replenish diminishing fish stocks and grow cyclone resilient crops. In 2016, political leaders from the 47 countries most vulnerable to climate change, including many situated in our region, declared their commitment to rapidly achieving carbon-neutral, climate resilient economies. Australia once played an impressive role on the global stage where we made strong contributions to environmental initiatives and poverty reduction. Over the last five to ten years those contributions have weakened considerably. In Laudato si', Pope Francis' statement on the environment, he invites all of us to hear 'both the cry of the earth and the cry of the poor'. Calls from many communities — including throughout East Africa — have never been louder and it is time for us to re-imagine what we as a country can and should do to respond to ensure a safe future for all. Paul O'Callaghan is CEO of Caritas Australia. "With over 30 years of involvement in global affairs, I have never seen anything on this scale. Millions of men, women and children are, literally, desperate for food and water." Thank you so much Paul for reminding us of the dreadful humanitarian crisis facing East Africa and Yemen. I really appreciate your timely article. I feel very angry and frustrated with Australia and the wealthy countries of the world - why aren't we seeing these people's needs on our TV screens and in our newspapers on a daily basis? And why didn't the G20 Summit make this hunger crisis a priority discussion issue? It must be extremely depressing for Relief agencies like Caritas to be so aware of the human need but lack sufficient global financial resources to help in the way they would like. I ask Eureka Street to keep reminding us of this desperate situation. And Paul, can you tell us if and how the Australian Government is responding? The least we can do is write to our Federal MPs pleading with them to commit the Government to a more than generous aid effort. One thing home owners can do is instal roof-top solar panels. Having done this years ago, electricity costs me nothing and it's a great help in mitigating climate change. Thank you for this interesting article. I didn't know about the severity and widespread nature of this famine. The climate change link seems to be under-reported (or not reported at all by mainstream media); but appears to be the most critical threat facing these communities now - and ours soon. I agree with Robert, how is our Government responding? More generous aid in the short term is helpful, but not a solution for the long term global future.